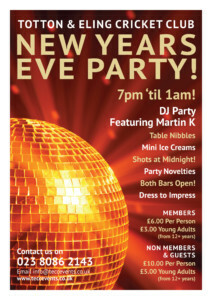 Come and see the ‘New Year In’ at our fantastic New Years Eve Party! The Party starts at 7pm featuring DJ Martin K, with dancing ‘til 1am! Included in your ticket price will party novelties, a selection of table nibbles served throughout the evening, mini ice creams at 11pm and shots at Midnight!